This weekend, we were at Pratt's Country Store here in Knoxville and one of the items we bought was Norris Dam Good Appalachian White BBQ Sauce. This is a local product that is named after Norris Dam - a part of the TVA hydroelectric system and the reservoir is a prime outdoor recreation area. Chef Michael Hatcher created this sauce with his 20+ years of culinary experience (including formal training at Le Cordon Bleu) and in the spirit of East Tennessee family traditions. You probably notice it's not red or brown...what gives? This is a white BBQ sauce. What is white BBQ sauce? White BBQ sauce originated in Northern Alabama, where Big Bob Gibson invented it at his BBQ joint in Decatur. White BBQ sauce is mayonnaise based with vinegar, salt, black pepper, and a few other things. Some have some sweetener put in, some like to add more heat like cayenne or horseradish. But in general, white sauces are tangy, simple, and used mostly for grilled chicken and other poultry. Mayonnaise based, I get it if you initially recoil and say, "Ewwww, mayo BBQ?" It does NOT taste like you think it would. Your food doesn't come out all white and goopy either. In fact, if I put white BBQ chicken in front of you, I doubt you would notice anything odd about it. You would just think it is a great tasting smoked chicken. Off white with visible specks of coarse black pepper, red chiles, and herbs. Straight out of the bottle, so tangy it will make you wince but also it has a surprisingly sweet finish compared to some versions. The Dijon in there is something I haven't tried in my white BBQ sauce recipes but I like it. On food, it is mildly tangy with a subtle sweetness. It is supposed to enhance, not cover the flavor of the food. Thinner than most BBQ sauces, as white sauce should be. The pepper and herbs will settle to the bottom so give it a good shake before each use, just like a Carolina vinegar sauce in that aspect. Mostly pronounceable things that you have in your pantry - stuff like JFG mayo (another Knoxville company), cider vinegar, brown sugar, Dijon mustard, lemon juice, salt, pepper, and herbs. It does have potassium metabisulfite as a preservative but that's it. The best chicken I have ever had in my life was Alabama white sauce chicken from Chris Lilly, pitmaster and operator of Big Bob Gibson's. He was teaching a class here in town and that was one of the dishes he made. We have a few different white BBQ sauce recipes that we make and love. That said, we haven't liked many jarred white BBQ sauces. 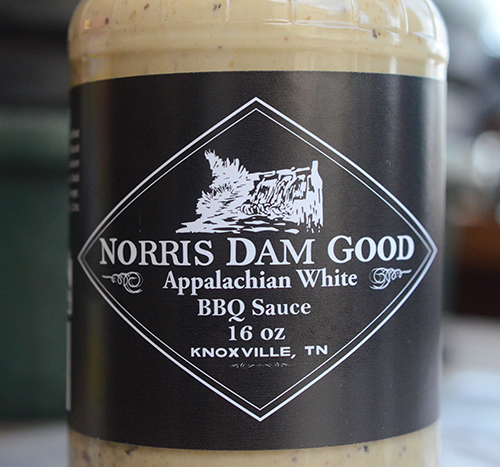 Norris Dam Good Appalachian White BBQ Sauce is one of the better ones that we have had. It was fantastic on fire roasted wings and I was even dipping our celery and carrot sticks in it. It was also super on smoked bone-in chicken breasts. Alexis said it would also be a fine slaw dressing. One thing that we both liked about it is that it doesn't feel or taste like a jarred sauce, they have kept the processing to a minimum. 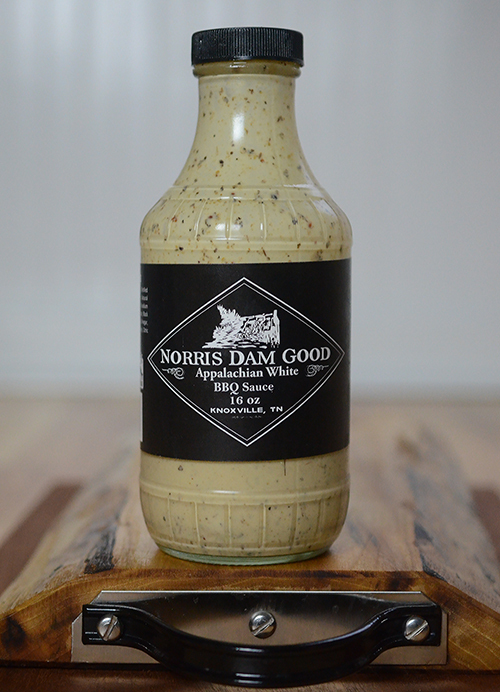 Overall, we're fond of Norris Dam Good Appalachian White BBQ Sauce and are going to buy more to have on hand. I'll still make my own too, but this is good stuff. 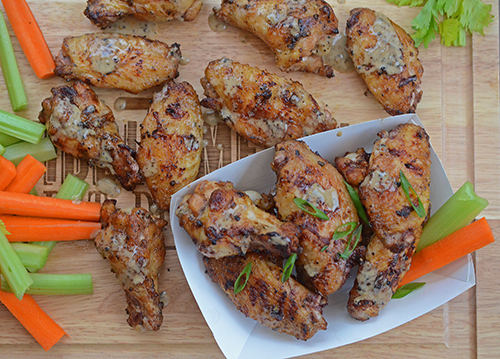 Here are some wings that we made this weekend. Since we're talking white BBQ sauce, I borrowed from the legendary Big Bob Gibson's whole chicken technique for my wings. Simple seasonings - If memory serves, they just season theirs with salt and pepper. I went a little more than that but it's still a simple rub. 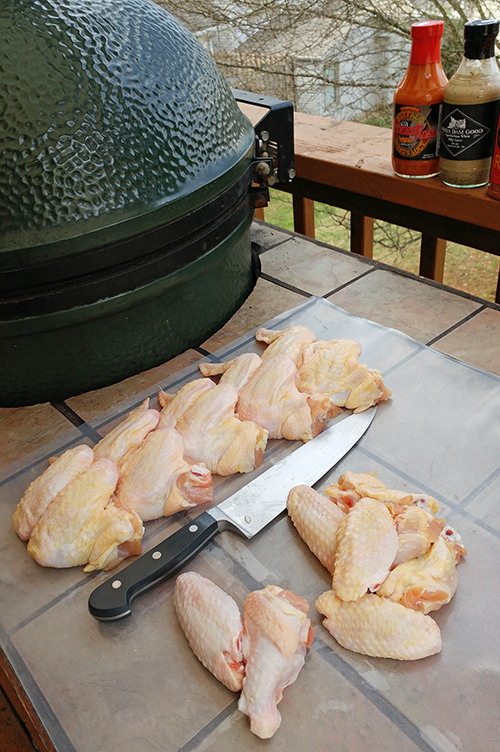 Oil trick - Big Bob Gibson's dips their whole chickens in oil after smoking and almost done. This gets their chicken crispy before saucing. So I tossed my wings in oil after they were mostly cooked. Sauce bath - They give their birds a sauce bath and then serve. The sauce just cooks onto the bird as it rests. My wings weren't going to have that kind of carry over heat, so I put them back on just for a few minutes to cook the sauce on a little. Preheat a charcoal grill to 400°f. Mix the dry rub ingredients together in a small bowl. Season the wings all over with the dry rub. 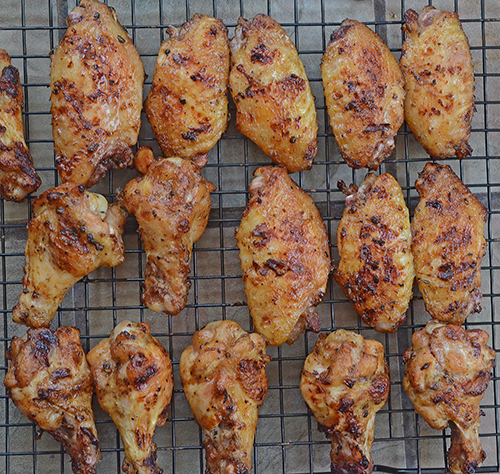 Place the wings on the upper rack or a raise grill grate on the grill and cook for 8 minutes. Flip the wings and cook another 8 minutes. 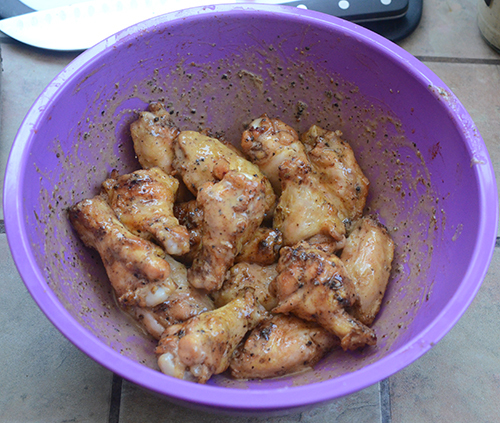 Toss the wings in a bowl with the oil and place back on the grill for 5 more minutes per side. 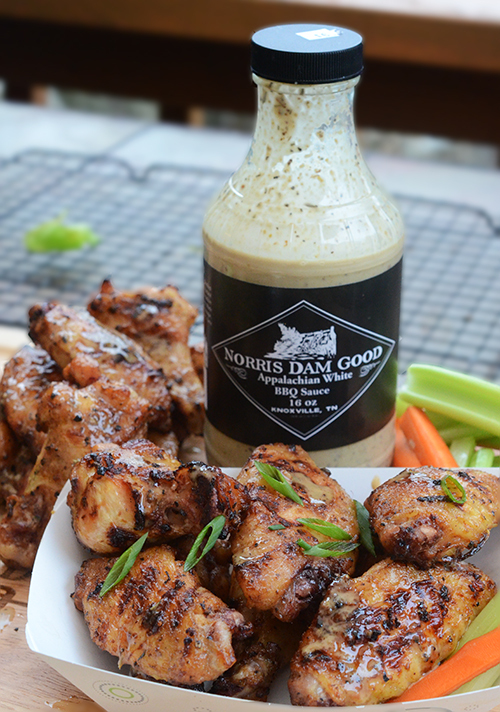 Toss the wings in a bowl with the Norris Dam Good Appalachian White BBQ Sauce and place back on the grill for 2 more minutes per side. Remove the wings and spoon any remaining sauce from the bowl over the top of the wings. I took advantage of the Spring like temperatures Knoxville has been having and trimmed my wings outside. Those family packs of wings are typically in the 4-5 pound range and have 14-15 wings, giving you 28-30 wing pieces. 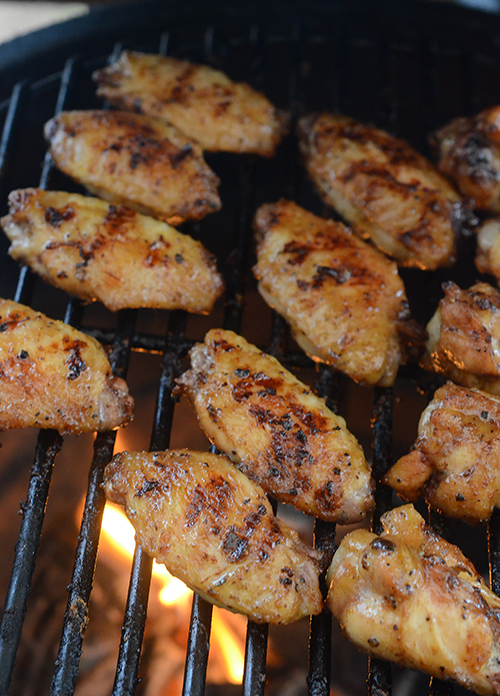 Cooking the wings on a raised cooking grate does two things. First, it cooks a little more gently, making your job easier. Second, it builds up color more evenly by roasting more than grilling. Some grills come with an upper rack, if yours has that, just use it. 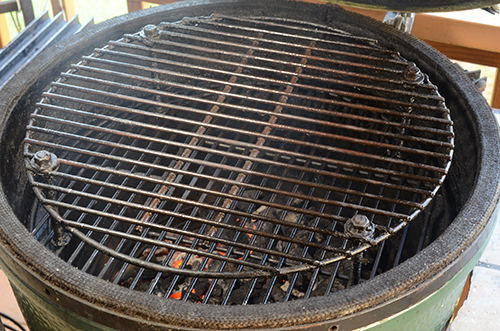 For kamado grill users, there are a lot of options like Adjustable Rigs, grid extenders, or just building your own like this one that I use often. I like to toss my wings in a large bowl like this. It just makes it quick and easy to coat them. You can just baste the oil and sauce onto the wings if you don't want to mess up a bowl or are worried you might lose some wings. See? Doesn't look like mayo. Nice and crispy too. 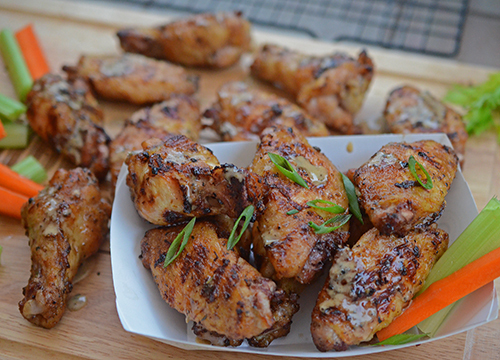 Drizzle that last bit of sauce over the wings, you don't want to waste any of that good flavor. So is everyone going to love it? No, everyone has different tastes. But if you like Carolina style vinegar sauce, South Carolina mustard BBQ sauces, or just want something away from ordinary - you should give this white BBQ sauce a try.